Last year, the number of people displaced by conflict and persecution rose significantly. More and more stories surfaced in the media, and the world awoke to the plight of refugees searching for home. In this issue of PWSDevelopments, learn more about PWS&D’s refugee ministry and the ways overseas support is helping families uprooted from Syria, South Sudan and Iraq find hope for a brighter tomorrow. 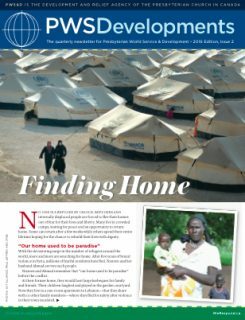 You can also read about Presbyterians across Canada who are helping refugees build safe and peaceful lives in Canada. To order copies of PWSDevelopments or subscribe to the mailing list, please contact Anna Muir (1-800-619-7301 ext. 293/amuir [at] presbyterian [dot] ca).